What is the COMBIN Function? 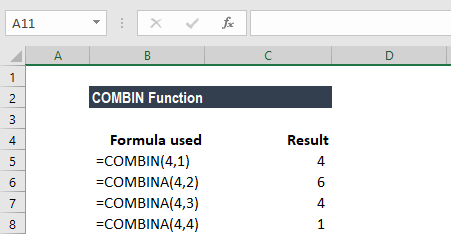 The COMBIN Function is a Math and Trigonometry functioFunctionsList of the most important Excel functions for financial analysts. This cheat sheet covers 100s of functions that are critical to know as an Excel analystn. The function will calculate the number of combinations without repetitions for a given number of items. It was introduced in MS Excel 2000. Number (required argument) – The number should either be greater than or equal to 0. Also, it should be greater than or equal to number_chosen. Non-integer values, if entered for this parameter, are truncated. Number_chosen (required argument) – It is the number of items in each of the combinations. It must be greater than or equal to 0. Non-integer values are truncated. Suppose we are given six numbers: 1, 2, 3, 4, 5, 6. Now let’s see how the COMBIN function calculates the number of combinations (without repetitions) for the other numbers of objects taken from a set of 4. Let’s now see how we can use this function in day-to-day life. Suppose there are 15 students and we wish to pair them into two-person teams. Using the COMBIN function, we can see the possible two-person teams that can be formed from 15 students. As seen above, 105 combinations without repetitions are possible. COMBIN does not count repetitions whereas COMBINA does. For example, in a set of three objects – a, b, c – COMBIN would return the result 3; the combinations are ab, ac, bc. Whereas, COMBINA would return the result 6; the combinations are aa, ab, ac, bb, bc, cc. The formulas used by both functions are different. #VALUE! error – Occurs when either of the argument is non-numeric. #NUM! error – Occurs when the value of either argument is outside of its constraint. When we speak about a combination, it is any set or subset of items, regardless of its internal order. Combinations are separate from permutations, as the internal order is significant for permutations.